James Bond literary news is going rather slow for the moment, but I’ve noticed that Raymond Benson’s next novel, A Hard Day’s Death finally got an Amazon page. Announced back in August, the book will be published by Leisure Books in April 2008. I even have cover art for you to see. Not too shabby. 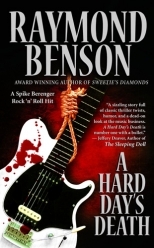 A Hard Day’s Death is about a private investigator who must solve the death of a rock star. Told tongue-in-cheek, real-life rock stars will make cameo appearances throughout the book. To check out the Amazon page and bookmark it so you can pre-order it in the future (right? ), go here . Love that cover art (and title). Kind of Bondian… somehow. Love the title, love the cover!